The vest consists of two panels, front and rear, which are joined and adjusted with velcro fasteners on the shoulders. They are mounted in two fastened at the bottom with Velcro pockets. 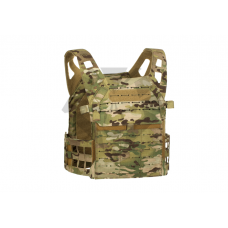 The entire plate carrier surface instead of trim tapes in MOLLE / PALS standard has laser-cut slots which still allows flexible configuration pouches and holders. In addition, main panel on the front is attached with Velcro and can be replaced with an integrated set of mag pouches panel. Inside the plate carrier has a longitudinal Velcro trims for the optionalinstallation of soft body spacers (sold separately). On both sides of the front panel are also adjustable loops to secure the wires to the radio or hydration system tube. Vest includes Velcro mounted shoulder pads that allow for even weight distribution.